New fragrance by the house of Gucci, named Flora by Gucci, aims at young customers and it was inspired by a floral motive. 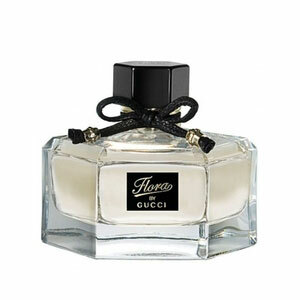 Flora is, after Gucci by Gucci, the second fragrance under creative leadership of the house of Giannini from Florence. The first one, Gucci by Gucci, is perfect for a powerful Gucci woman, while Flora is addressed at a sensual, young girl. Perfume Flora by Gucci opens the door to new creations by the house of Gucci, which are being planned for younger audience. Top notes introduce citruses and peony, a heart is enriched with rose and osmanthus (Chinese flower which enchants with fruity-floral aromas with leather notes), while base notes encompass patchouli and sandalwood. Perfumers behind this edition are from the house of Firmenich. In order to create a bottle for Flora, designers of the house of Giannini built on architectural structure of Gucci by Gucci bottle by giving geometric shape of hexagon to the new edition, while champagne nuance was chosen as colour of fluid. Advertising face is Abbey Lee, Australian model, who is wearing a silk dress with floral print. In a shot by Chris Cunningham in a cornfield in Latvia, Lee is captured as standing in the middle of more than 40000 silky flowers dancing in rhythm of wind with musical background of original remix - â€œI Feel Loveâ€� by Donna Summer. Inez & Vinoodh photographed advertising materials with a floral pattern. Perfume Flora by Gucci has arrived on the market in April 2009 and is available as 30, 50 and 75 ml EDT, as well as 100 ml deodorant, 200 ml perfumed body lotion and 200 ml perfumed body bath.